When I think of London, I think of big red buses, afternoon tea, and markets. You never know what you’re going to find in the city’s markets – some contain poorly made junk, which others feature works of art or the best cheese you’ve ever tasted. 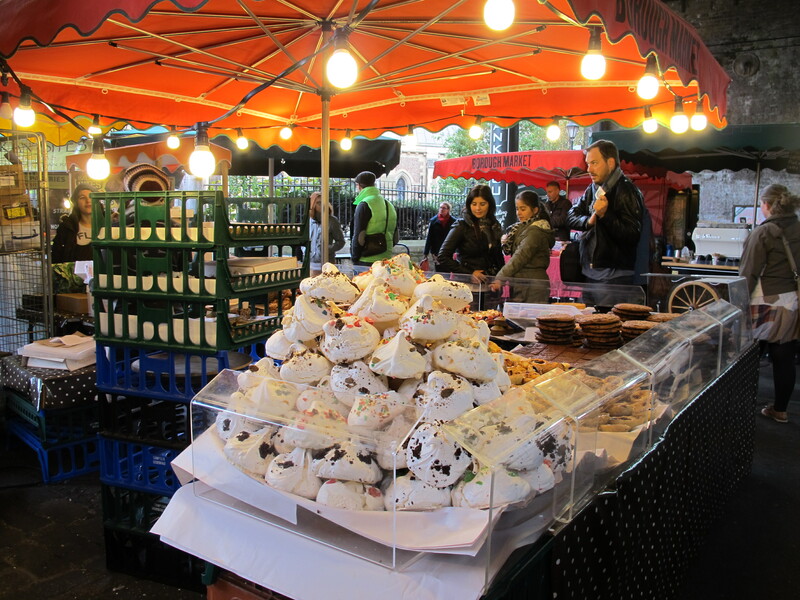 I visited three markets during my time here: Borough Market, Portobello Road market, and Camden Market. They each have a totally different vibe. Borough Market is a food market under London Bridge, and it’s a perfect lunchtime destination. For a few quid, you can get a steak pie or a curry or my favorite, raclette (cheese on top of potatoes with a side of mini pickles). You can also pick up sweets as big as your head, small nuggets of fudge, fresh cheeses, truffles, whole rabbits – anything you could possibly need to eat. There’s even a stall that sells nothing but cider! When to go: on a weekday before or after typical lunchtime. It’s a zoo on Saturday and closed Sunday. Camden Market is more of a craft fair, with halls and courtyards of wares. Some are handmade and some are clearly mass produced, but still not junky. The food here is also incredible, but can get extremely crowded. The nice thing about the market overall is that it’s so compact – if you like something and don’t buy it the first time, it’s not that hard to get back for another pass (the opposite is true at Portobello Road, for example). And when you need a break from the crowds, you can watch barges pass through the locks. When to go: on a Sunday, because it’s the only market open this day! When to go: Saturday, as close to 10 as possible. It gets crowded quickly. When I leave Europe, the markets are one of the things I miss the most. Luckily, I still have market adventures in Paris, Barcelona, and Istanbul ahead of me (all in the next week!). Adventure, ahoy!